Ball Pyramid is the world’s tallest sea stack. This amazing Ball Pyramid is the remains of a shield volcano formed millions of years ago. Discovered by Lieutenant Henry Lidgbird Ball of the Royal Navy in 1788. The stack is 562 metres high and measures only 200 metres across. Located 20 km southeast of Lord Howe Island. Lord Howe Island is in UNESCO World Heritage List and lies approximately 600 km northeast of Sydney and southeast of Brisbane, Australia. Climbing on the stack is now not permitted and can be viewed closely from cruise boats. World class diving and fishing spot. 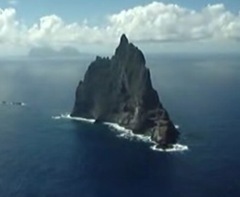 Read more about Ball Pyramid from Wikipedia and view from Time’s Australia’s Hidden Islands. More information on Lord Howe Island is here. An interesting aerial view of Ball Pyramid as video clip is here.